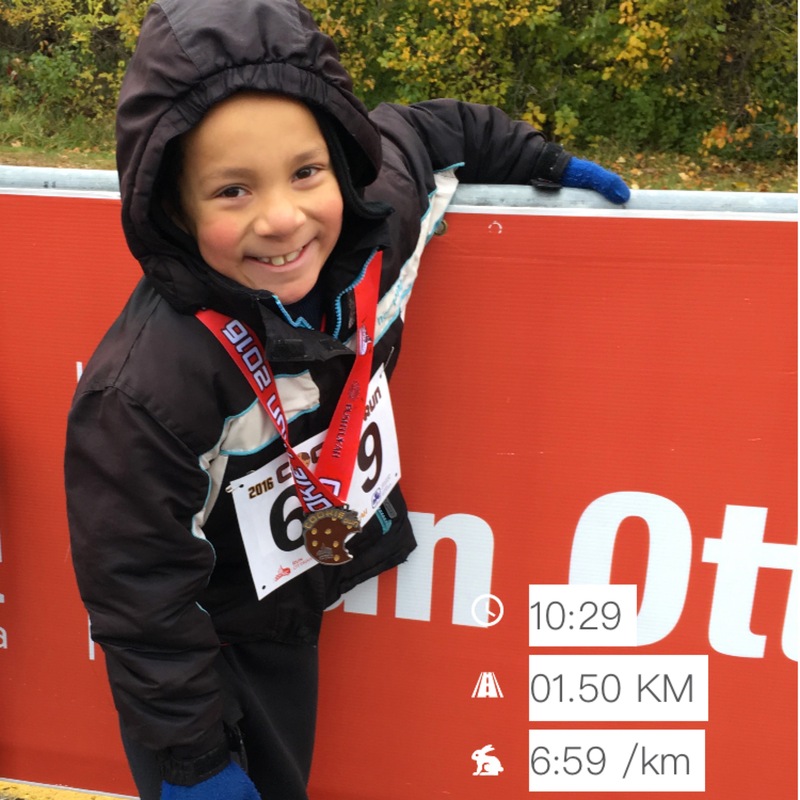 family – Pump Those Crazy Legs! 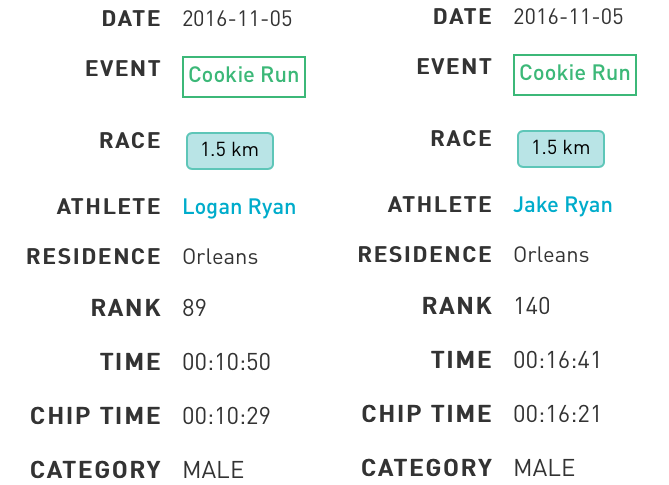 In addition to my own races this summer, I also managed to do two with Logan as well! 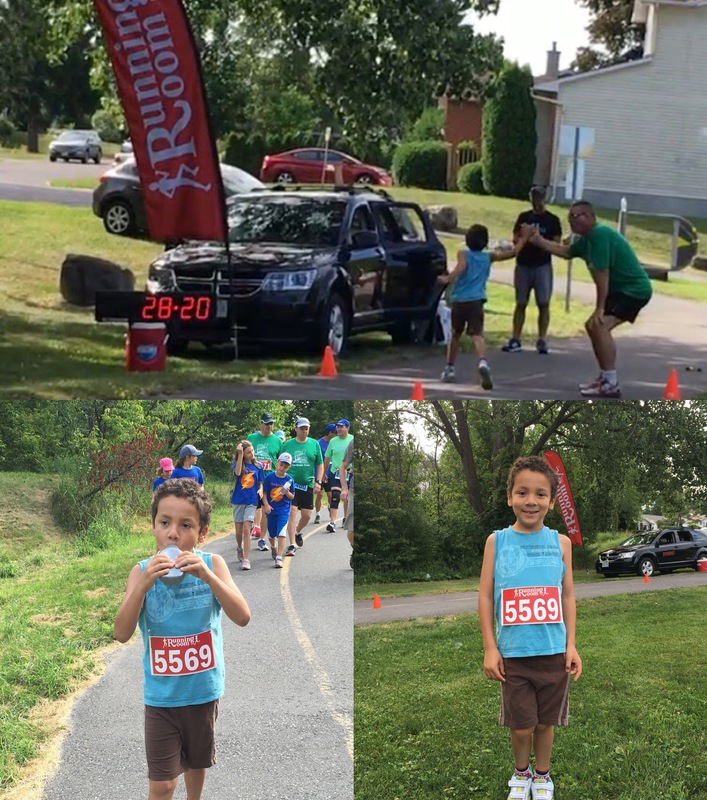 The first race was the Blackburn Hamlet Fun Run in June. They have some really beautiful trails as part of the 5k course, though we opted for the kids 1k this time. As luck would have it, it was an absolute downpour that morning. I asked the boys if they still wanted to run, throwing in a “C’mon it’ll be fun!” which managed to convince Logan. (He’s always up for something silly!) So we headed out in the rain, ran through wet grass, mud, and the biggest puddles you can imagine! Logan jumped into every puddle and dramatically waded his way through the waters. 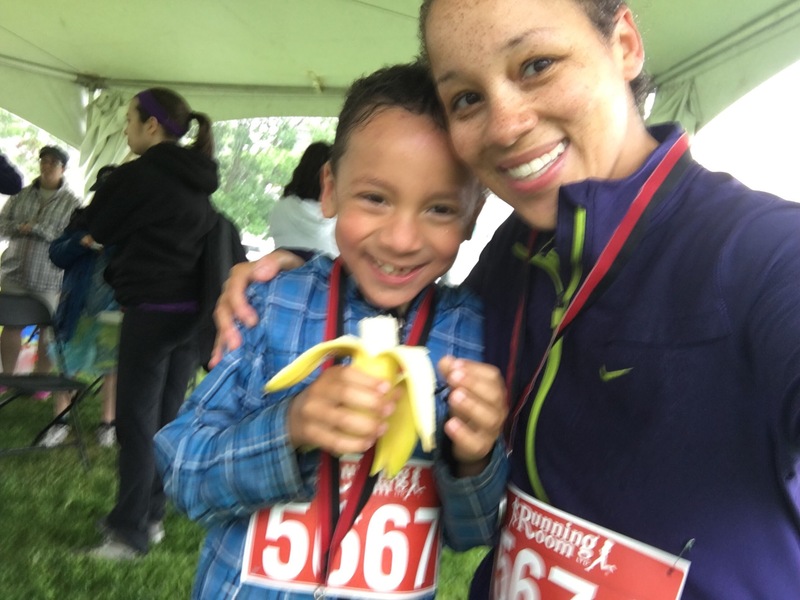 He finished his 1k in just under 7 minutes and treated himself to TWO bananas promptly afterwards! Haha! We had a great time! The second race we participated in together was the 3k Neuro Dash in August. 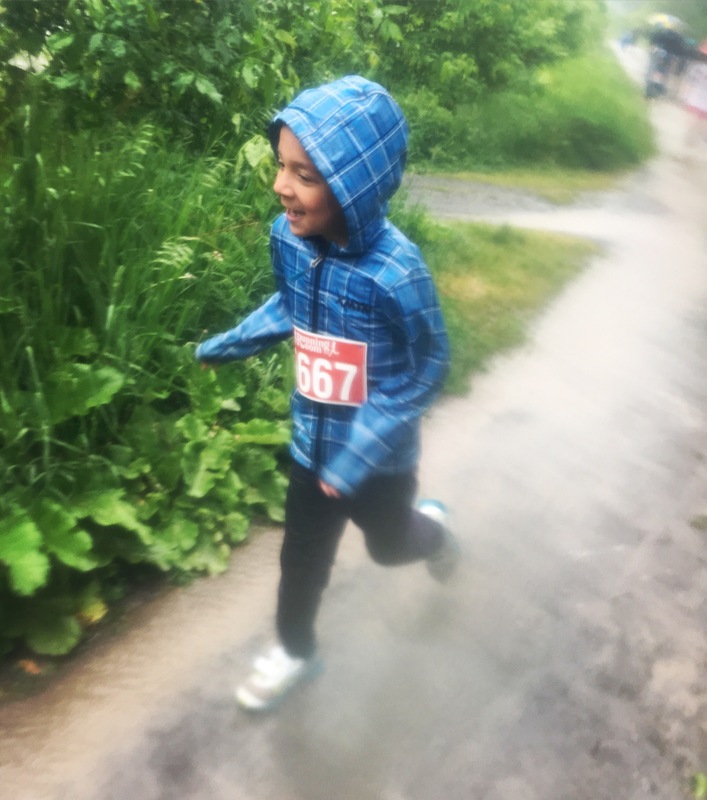 Logan was a bit less enthusiastic about this race as he found it too hot that morning, and so he ended up trudging through most of the race (with me running in crazy circles around him squealing “Let’s go! Let’s run!”). Sipping his water bottle the entire time, briefly switching to the cups at the water station. I loved watching him cross the finish line though, he was so excited and proud when he got that big high five! 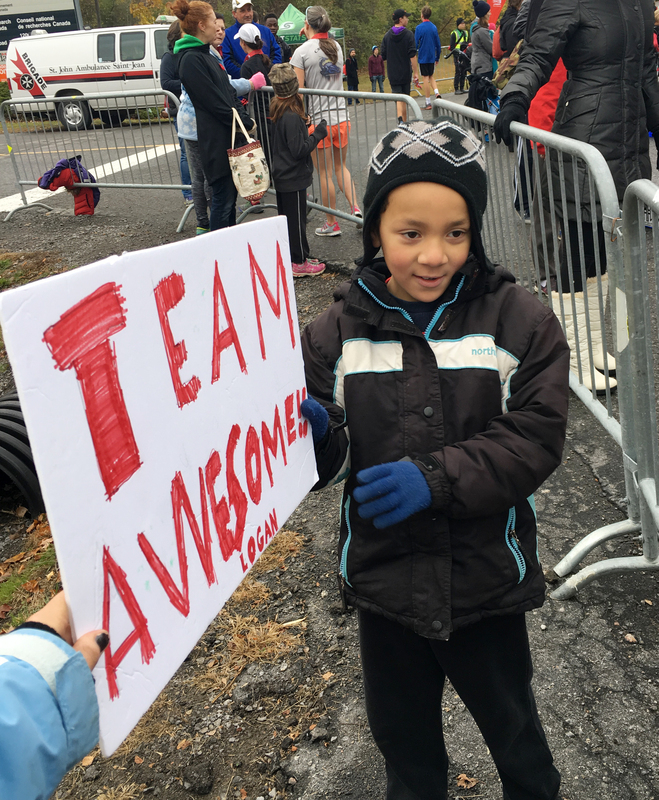 This race was also the first time Logan got to meet and chat with a handful of my friends from my Running Room 10k clinic group. It was so awesome to be able to show him the people I run with. Maybe one day he will join us! ​​I’m writing this post as a bid farewell to 2015 – a year that I found to be both full and satisfying. As the weather warmed back to tolerable levels, my enthusiasm to be outside grew as well. After being stuck inside for so many months avoiding the cold, I was ready for the outdoors! I decided this was the perfect time for me to act on my interest to take up running! I started out awkwardly at first, requiring many walking breaks; but in no time found myself running for 20, 30, 40 minutes straight! And once I had established that, I began to work on increasing my pace to cover the same distances in faster times. I never felt more proud and amazed by my own body and what it was capable of! I ended up participating in 5 different races from June (two weeks after surgery!) to December. My last race was especially meaningful as my two boys (ages 4 and 6) were eager to come run with me! Instead of my usual 5ks, this was a 3k walk/run located close to our home and what I believed to be the perfect race to start them off on! 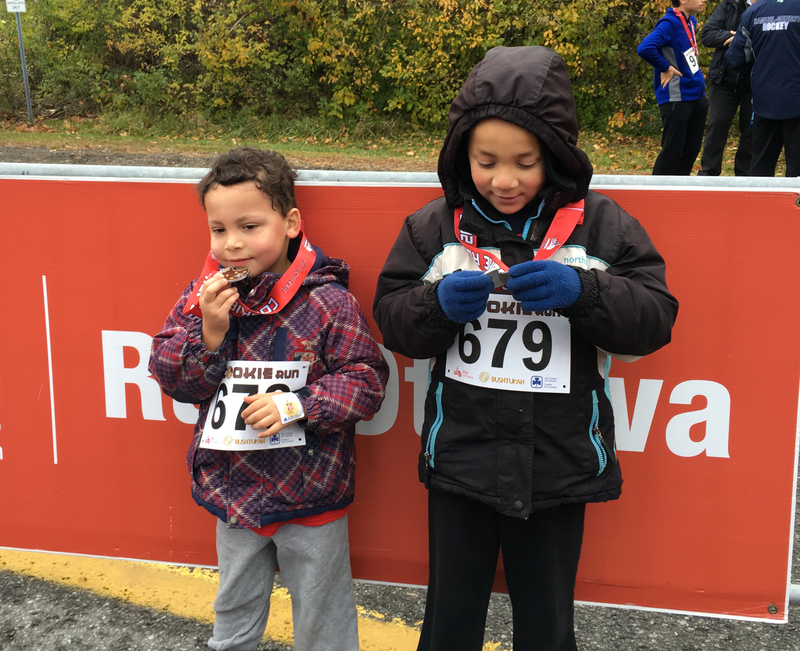 Running Room founder John Stanton presented them with their medals when they crossed the finish line, and we were all so proud! My boys had a great time and I’m looking forward to bringing them with me to more races in the summer! Looking ahead to what I want for 2016..
Definitely continue with my running! Making sure to keep it fun by not putting too much pressure on myself; run when I can and not freak out if it doesn’t work out that particular day. I’ve got to keep in mind that running is first and foremost what I do to de-stress and invigorate myself. Unfortunately, I have this habit of wanting to be absolutely amazing at everything I do, which is impossible and causes me to push myself too hard too quickly and burn out in an attempt to get myself up there with ‘everyone else’. I would like to work on increasing my pace, however, as my PR at the moment for 5k is a bit sad, 34:44mins. I’d be ecstatic to run a sub-30 minute 5k this year! I think I will need to figure out some ideas for strength training to help me attain those faster times I yearn for. Particularly during these cold, dark winter months. I am still doing my runs, even in the snow, but I haven’t been getting out as frequently. Ideally I’d find an option for something cost-effective that I could do at home. Since 2013, about a year after I started antidepressant medication, I reached my highest weight ever and have struggled to lose any of it. When I saw that my weight wasn’t budging even after taking up running, I realized that I really needed to look into my eating habits. Tracking my caloric intake with MyFitnessPal and ‘re-learning’ how to eat is what finally helped me get those numbers back under control. Two weeks ago I discovered that I’ve returned to a ‘normal’ BMI of under 25! This subject is really deserving of its own post, so for now I will simply state my goal of continuing to eat properly and lose weight! As my boys are both of school age now, I am hoping we can get out and experience more adventures as a family this year too. Perhaps a trip camping? I would also love to be more involved at their school (while I realize I should probably also turn my focus to finding some actual *paid* work this year too). I so enjoyed helping out with the kindergarten Christmas party right before the holidays, and my son was so happy to have me there to see what he gets up to at school! Socially, I’m a bit of a stay-at-home hermit. So I aim to use Team Awesome as a means for me to get to know other people who share similar interests, and maybe even find some running buddies! I want to be out there in the community this year – with my husband, with my kids, with my friends – and experience as much as possible of what Ottawa has to offer!